I’m a big fan of Harry Potter, so I’ve attempted many different designs in this genre. This one encompasses all four houses, promoting house unity! It’s really quite, but can be time-consuming the way that I chose to do it. 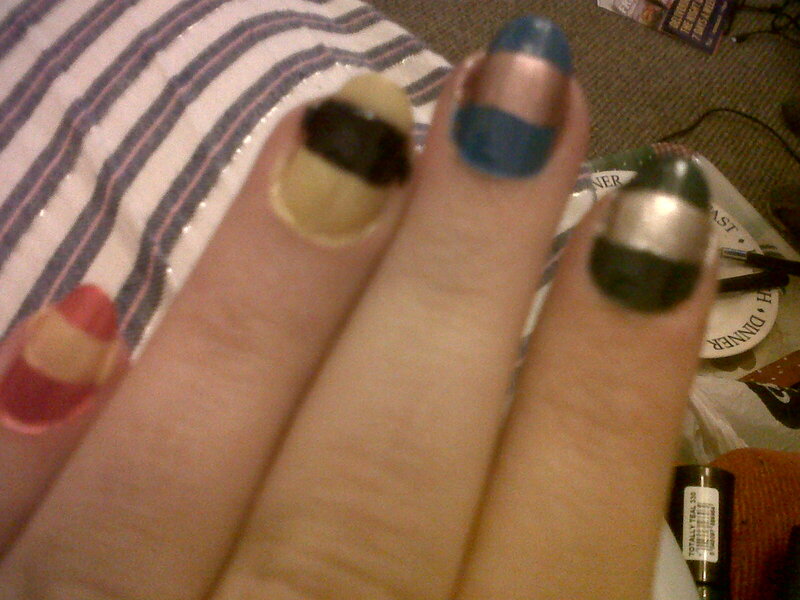 The colours are (L-R) Gryffindor: Red with a Gold inset (although it looks yellow in this photo); Hufflepuff: Yellow with a Black inset; Ravenclaw: Blue with a Bronze inset; Slytherin: Green with a Silver inset. For the thumb, I added an HP themed separate design. I chose not to use a base coat on this occasion, purely because of the way I ended up creating this style. Using the main colour of each house (red, yellow, blue and green), I added two coats to each assigned nail. Once dry, I then used a cotton wool pad and nail polish remover, folded in half for the straight edge, to take off two thirds of the colour of each. I added two coats of the centre stripe over the rest of the nail, from the top of the bottom third to the tip, and allowed to dry. Again with cotton wool and remover, I took off the top third of the colour, and used the main colour of each to add the last section of colour. After drying completely, I finished with two coats of clear. It’s important to wait for all sections to dry entirely before adding the top coat, as it will run the colour into each other if not. FOR THE THUMB, I used a base coat once and two coats of black. 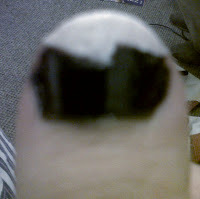 Once dry, I used the nail polish remover and cotton wool pad to take off the tip as close to the intended design as possible. I then used a white varnish to add the lightning-bolt stripe along the top, going slowly to ensure a straight edge. Finished with two coats of top coat. With pens, stripers or even ordinary brushes, it is very easy to add the centre stripe in a variety of different ways. Take the time to experiment and practise with how you want it to look – polish remover is there for a reason! This design was completed before my pens arrived, so the thumb would be much easier with. Again, it took time and experimenting to get the desired look. Look out for my other Potter styles – there’ll be many more to post!